On my first day, I posted about The Chap Mag. 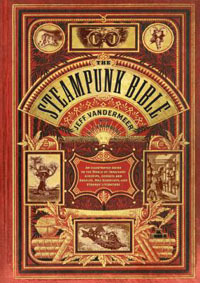 Among the many books I took with me, there is The Steampunk Bible by Jeff VanderMeer and S. J. Chambers. If you ever wondered what is Steampunk about, this is the book you need to buy. For everyone else, this book lives up to its name. The photography and art are great, and the book is an excellent overview of Steampunk filled with interesting information introducing different aspects of the Steampunk culture like music, movies and books. Note that the complete title is: The Steampunk Bible : An Illustrated Guide to the World of Imaginary Airships, Corsets and Goggles, Mad Scientists, and Strange Literature. You’d better write it down.